For our wedding anniversary, because first year is “paper”, I’d gotten David a cookbook entitled II Love Bacon! (you know, the other great love of his life). There were a host or interesting recipes to try out, and last night we finally got around to trying one of them. 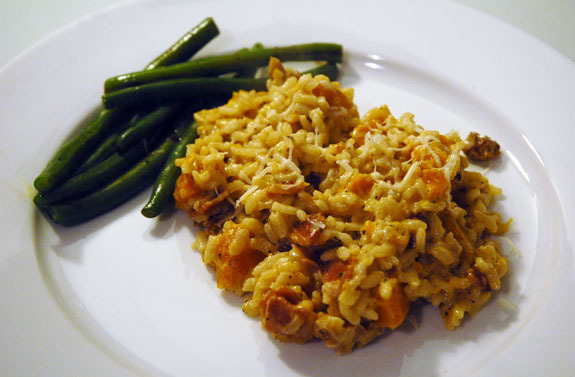 Nothing like a sunny fall day, and happening to have a butternut squash on hand, to inspire a trial of a fall risotto. adapted from I Love Bacon! Preheat oven to 350 F. Fill a large saucepan with water and bring to a boil over medium-high heat. Add squash and cook until tender, about 15 minutes. Use a slotted spoon and transfer squash to a baking sheet. Coat with olive oil and season with salt and pepper. Roast for about 10 minutes, or until lightly browned. In a medium skillet, cook bacon until crispy. Drain on paper towels and set aside. Heat olive oil in large pot over medium heat. Add onion and cook until tender. Add rice, stirring to coat with oil. Add chicken stock, 1 ladle at a time, stirring constantly, until each ladleful is absorbed. About 15 minutes into it, before adding the last ladle of stock, add squash, bacon, walnuts and parsley. After stock is absorbed, add butter and stir until melted and creamy. Season to taste. Garnish with cheese and serve. A few notes on preparation: the original recipe called for fresh sage leaves to be fried in the bacon fat, but we were lacking sage unfortunately. Instead, David added Italian seasoning to spice it up. It also called for white wine to be included in the risotto, but David made the risotto how he usually does (we also didn’t have wine either). It also wanted pecans, but we substituted in walnuts instead. We were quite pleased with how it turned out–all kinds of nutty! Having fresh sage would likely have improved it even more, but it was flavorful and earthy, with the saltiness of the bacon against the sweet, nuttiness of the butternut squash. The inclusion of some kind of nut (be it walnut or pecan) was also nice, adding a nice crunchy texture. It made for a light dinner, as we just paired it with some steamed green beans with balsamic vinegar.